Background: Nickel (Ni) is widely distributed in the environment and continuous exposure to this metal may lead to pathological manifestations, such as the human allergic contact dermatitis. Methods: The in vitro effects of Ni on human healthy non allergic peripheral blood mononuclear cells (PBMCs) in the absence or presence of red grape polyphenols have been evaluated. 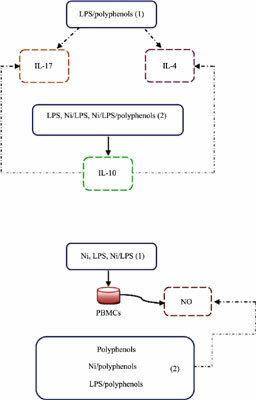 In the culture supernatants, levels of cytokines have been determined by ELISA, while nitric oxide (NO) concentration has been evaluated by a colorimetric procedure. Results: Ni per se did not affect release of interferon-γ, interleukin (IL)-4 and IL-10. Instead, this metal dramatically reduced production of IL-17 which was restored by the supplementation of polyphenols. Finally, while Ni significantly increased generation of NO, polyphenols reduced production of this compound. Conclusion: Taken together, all these data may indicate a preventative role of polyphenols against Ni exposure in non allergic to Ni individuals, also confirming the immunomodulating role of these natural products. The interaction Ni/polyphenols/lipopolysaccharides will also be discussed. Keywords: Lipopolysaccharides, nitric oxide, non-allergic, nickel individuals, peripheral blood mononuclear cells, polyphenols. Keywords:Lipopolysaccharides, nitric oxide, non-allergic, nickel individuals, peripheral blood mononuclear cells, polyphenols. Abstract:Background: Nickel (Ni) is widely distributed in the environment and continuous exposure to this metal may lead to pathological manifestations, such as the human allergic contact dermatitis. TNF-Alpha Antagonism in Severe Asthma?